James Cagney was pretty much a one-of-a-kind actor. AFI ranked him as 8th on its list of greatest male stars of Classic Hollywood Cinema. Orson Welles said he was probably the greatest actor who ever appeared in front of a camera. Director Stanley Kubrick considered him to be one of the greatest actors of all time. He got his start as a dancer (costumed as a woman in a chorus line in vaudeville in 1919) and toured the circuit for many years, eventually marrying his partner. He built his film reputation playing tough guys in a string of crime filled Warner Brothers films in the early 1930s. He won his Oscar for singing, dancing and acting the life of fellow vaudevillian George M. Cohan in Yankee Doodle Dandy. I don’t think Edward G. Robinson, Robert Mitchum, Al Pacino or Robert De Niro could have pulled off that type of career about face although De Niro did play the saxophone in the musical New York, New York. 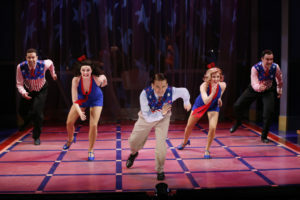 Cagney The Musical was a hit off-Broadway and is currently receiving its West Coast Premiere at the El Portal Theatre. 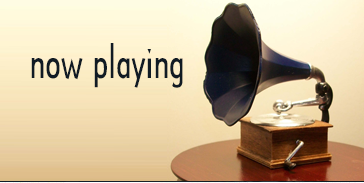 Playwright Peter Colley has written a strictly by the numbers bio with the dialogue mainly serving as a bridge between the 18 musical interludes. He uses a framing device of Jack Warner presenting Cagney with his SAG Lifetime Achievement Award in 1977 but he doesn’t just open and close the show with the backstage scene between the two combatants, he returns to it several times inducing more flashbacks. Colley mixes facts and dates to suit his storytelling. He posits that Cagney returned yet again to Jack Warner and his studio and achieved success in White Heat after the failure of his supporting performance in the Bob Hope film The Seven Little Foys, yet Heat was released in 1949 and Foys in 1955. 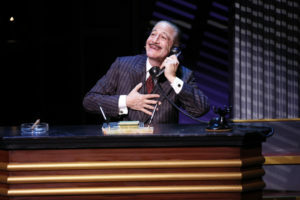 Bill Castellino’s direction isn’t able to infuse much life into Colley’s pedestrian script and his six actors have a lot of space to fill on the Debbie Reynolds Mainstage. 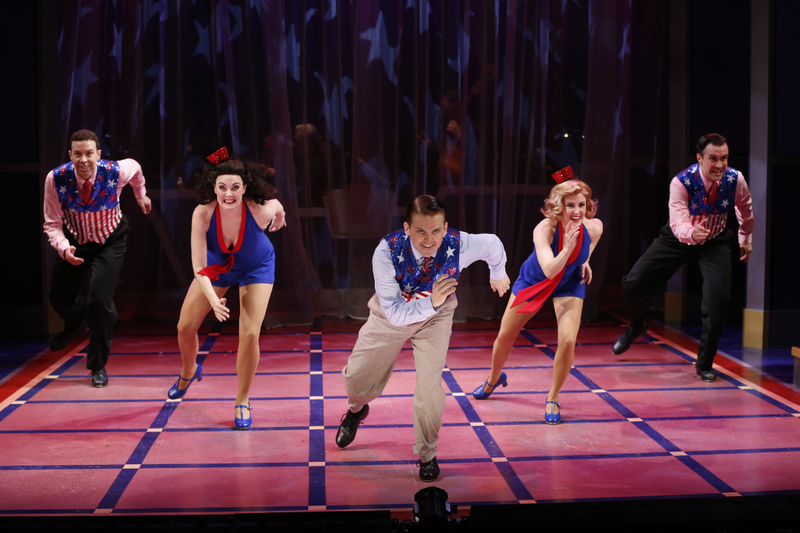 The real star of this production is the choreography by Joshua Bergasse. 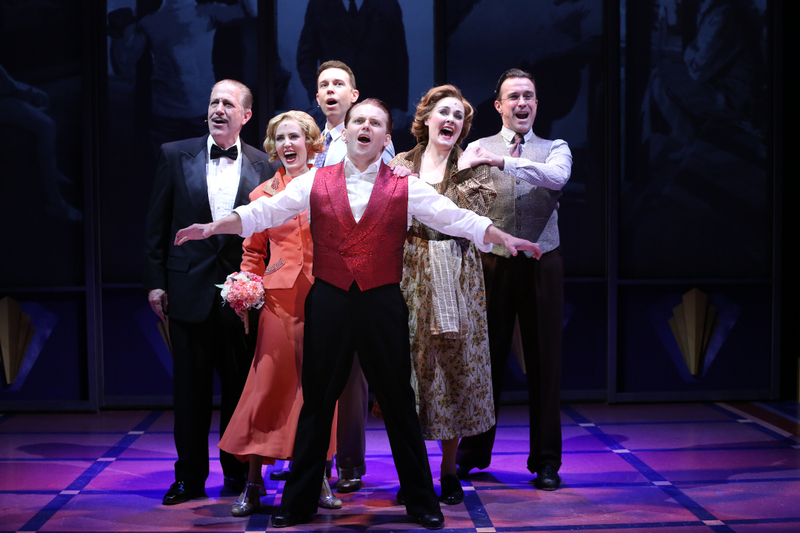 He is lucky to have Robert Creighton as Cagney who, short and solid as the original, really dazzles with his footwork and overall energy and pizazz. 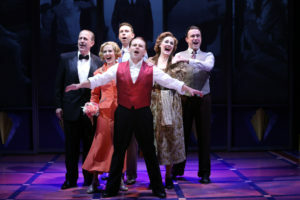 The talented ensemble of Jeremy Benton, Danette Holden, Josh Walden and Ellen Z. Wright, who besides playing a myriad of often quick-change roles, dance up a veritable storm in the big production numbers, mostly featuring Cohan’s songs from Yankee Doodle Dandy. The quality of those songs make the original score by Creighton and Christopher McGovern seem pretty threadbare. Musical director Gerald Sternbach leads the onstage band and gives the tunes their due. Bruce Sabath also provides strong support as Warner. 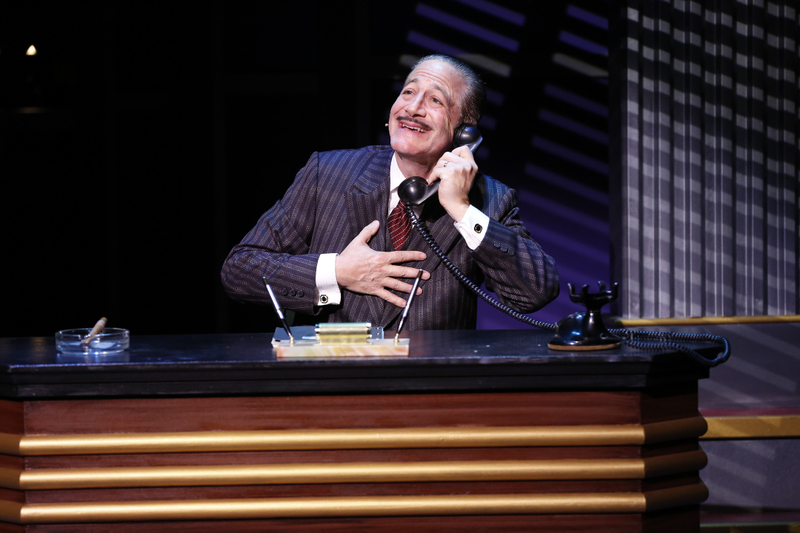 If you have ever wanted to see the much talked about Jack L. Warner sing, this just might be the musical for you.